White House Takes Aim At Financial Protections For Military Documents obtained by NPR show proposed changes that critics say would leave service members vulnerable to getting ripped off when they buy cars. The White House is proposing changes to the Military Lending Act that critics say would leave service members vulnerable when they buy cars. "If the White House does this, it will be manipulating the Military Lending Act regulations at the behest of auto dealers and banks to try and make it easier to sell overpriced rip-off products to military service members," says Christopher Peterson, a law professor at the University of Utah, who reviewed the documents. The product Peterson is referring to is called gap insurance. Here's how it works: Cars lose some of their value the moment they are driven off the lot. Dealers often tell customers that if their car gets wrecked in a crash they could be financially harmed because regular insurance may not pay out the entire amount owed on the loan. Peterson says some car dealers push this insurance product really hard. "They convince people they've got to have this gap insurance," he says. That kind of insurance can actually be inexpensive. Peterson, who helped write the regulations for the Defense Department, says it often costs as little as $20 to $30 a year and is available from a car buyer's regular insurance company. "But if you buy it from your car dealer, they may mark it up. ... I've seen gap insurance policies being sold for $1,500" over the course of the loan, he says. The rules to protect service members effectively block auto dealers from tacking on an extra product — such as overpriced gap insurance — and rolling it into their car loans. The industry has been lobbying to change that, and the White House appears to be sympathetic. The administration just sent the latest version of a proposal to the Defense Department, and documents show that it would give car dealers what they want. Peterson says the revised rules could also allow dealers to roll in all kinds of other add-on products. "Service members certainly should have the same access to credit protection that their civilian counterparts have," says Paul Metrey, vice president of regulatory affairs and chief regulatory counsel for the National Automobile Dealers Association. Now when service members buy cars and get loans at the dealer, he says, this "valuable" gap insurance product "is effectively not available to them." But Peterson says service members can still get this kind of insurance elsewhere, and often at a much better price. "If somebody really wants to have some gap insurance to protect them from this situation, they should just go to their insurance company and buy it," he says. Meanwhile, critics say that another change in the works would more broadly weaken the enforcement of the Military Lending Act. It involves Mick Mulvaney, the Trump administration's acting director of the Consumer Financial Protection Bureau. Under Mulvaney, the bureau is planning to halt regular monitoring of payday lenders and other firms to see whether they are violating the act and cheating military personnel. Retired Army Col. Paul Kantwill recently left a position at CFPB, where he worked on issues facing service members. "I am very concerned about" the prospect of weaker oversight, he says. The bureau says it would investigate complaints of abuse. But Kantwill says that is not enough. He compared the proposed changes to "removing the sentries from the guard posts guarding your military installation or your compound." He says the troops need protection. Before the MLA was put in place, many service members got stuck in damaging high-cost loans, he says. Kantwill says that going back to his days as a U.S. Army lieutenant in the 1990s, predatory lending was a big problem. He remembers there were 21 high-cost lenders and vehicle title-loan businesses just outside the main gate at Fort Campbell, Ky. "The Military Lending Act and the regulations that implement it have gone a long way toward eliminating a lot of those practices," he says. Kantwill says when people in the service get mired in debt and high-cost loans, that creates problems for military readiness. They can lose security clearances or just get distracted by financial trouble at home. "And it can get even more serious than that," he says. "Service members are kicked out of the service for reasons that involve their inability to handle their financial affairs." All that is why Congress passed these special protections. So why would the CFPB pull back on enforcement this way? Under Mulvaney, the bureau is claiming it might not have the legal authority to actively go looking for violations of the Military Lending Act. The CFPB is planning to ask for Congress to give it express permission to do this active monitoring of lenders' MLA compliance if that is what lawmakers intended. That's according to a draft document circulating within the bureau obtained by NPR. It is unclear if Congress would do that to spur the CFPB to return to its previous level of enforcement. Kantwill disagrees with that interpretation. "There is broad specific authority for the bureau to be able to examine for these sorts of issues," he says. 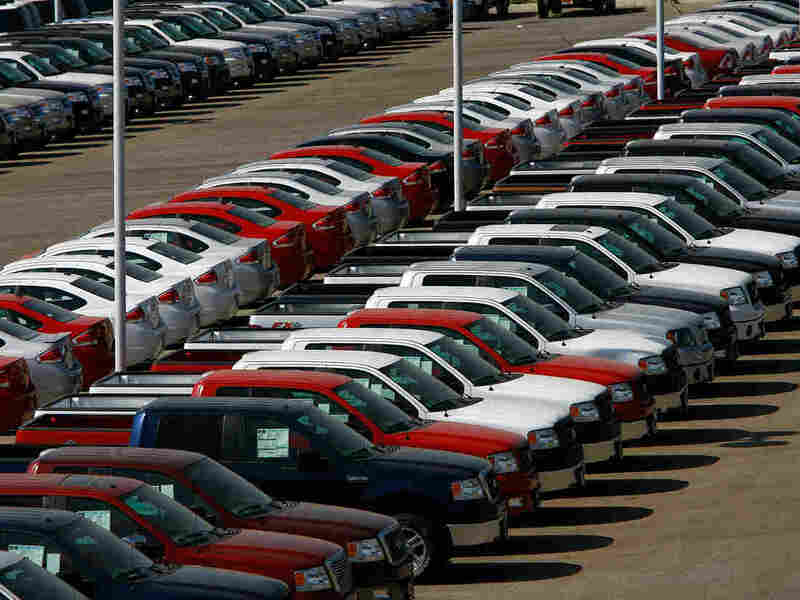 As for the changes requested by the auto dealers, allowing them to roll products such as extra insurance into car loans, the Defense Department says the issue is still in the proposal stage. In a statement, the department says any changes will be made "only if necessary and in a way that does not reduce the MLA protections afforded Service members and their families."